Crazy Idea: CR Infill station between Canterburry St & Cummins Highway. Crazy as it would probably need land taking (doesn't look like enough in the ROW, but maybe with a center platform for 2 tracks and the third moved). I would envision it probably as part of a Regional Rail like roll out with EMUs. Just seems like an ideal spot for public transit especially if headways are good. The NEC is too hella congested to add new infills north of Pawtucket, much less intracity. Amtrak traffic modeling paints a positively brutal picture with projected 2030 growth and into the Superduper 2040 HSR era. And if NSRL is in the mix an orderly procession from Ruggles to 128 on 4 filled-up tracks is going to be crucial for traffic management, likely preventing any infills. A future where the Orange Line gets +1'd to Rozzie alongside Needham CR...or outright swallows it to W. Roxbury...really really reduces the utility of Mt. Hope Redux because the headways will be so much better on Orange + bus out of an uncongested terminal where Rozzie becomes the new terminus of a few Forest Hills bus routes. Hyde Park is only served by some Providence/Stoughton--and not Franklin--trains...so that too is a near-useless NEC stop with anemic scheduling that can't reasonably improve in a future where swelling Amtrak traffic puts pressure on all. Especially since HP would have to be whacked from the Stoughton schedule anyway to support any extension to Taunton, Fall River, or New Bedford. Since Fairmount station is right down the street from Cleary Sq. and the probable redesign for HP station when Track 4 is re-added has fugly operational constraints (2-track island that requires crossing over against Amtrak traffic to reach)...you're more likely to see HP outright abandoned after Fairmount Line service increases permanently stiffen frequencies at Fairmount station. Then see the Cleary Sq. buses re-drawn to loop at Fairmount. At absolute most you may only see a tradeoff of reinstatement of the Readville NEC platforms in exchange for deleted HP, since the Readville platforms can be quad-track configured for local stopping without need to cross over the center express tracks like the proposed HP redesign. So for actual intracity future on the NEC it's a -1 stop consolidation or a draw if reanimated Readville gets traded for deleted HP. And maybe a -2 stop consolidation if the Orange-swallows-Needham scheme ends up mothballing Forest Hills (since that's currently only used by Needham). Mt. Hope's somewhat anemic ridership was due in large part to the density cavities between Forest Hills and Hyde Park from the cemeteries to the east, Sherin Woods to the west, and interruptions in the E-W street grid due to both areas of conservation land. When they were ballparking potential Orange Line extensions past Forest Hills in the 70's, this put a damper on the Readville alignment compared to the more uniformly dense West Roxbury alignment because the first intermediate stops along the NEC suffered in comparison from the cavity. Same phenomenon would be in effect with Mt. Hope Redux, as...much like the original CR stop...the cavity starts in earnest immediately south of Canterbury while the desireable density that exists north and west overlaps too much with the Forest Hills and Rozzie station catchments. Because this is all shaped by conservation land, the characteristics haven't changed much since 1979 despite an overall population growth. Now...if you want a good intracity infill candidate for the EMU era, try Grove Hall on the Fairmount Line. That was under consideration as an infill stop during the Improvements Study scoping, but the neighborhood pooh-poohed the idea and thus the Uphams Corner to Four Corners stretch ends up with conspicuously wide stop spacing. I don't know if GH is seriously going to get a chance at second bite at the apple anytime soon since there's still so much work left to do on service increases to max out the infill investments already made. But once the line has been cooking to critical mass at full headways and electrification for a few years GH might be a possibility well worth revisiting. There used to be a stop near there, but on the other side of Cummins, down at Blakemore St. I think we'd probably more likely see restoration of that one, however I'm pretty sure some of the land needed for it was lost and/or the extra space required for ADA compliance would make restoration tricky. Definitely something that transit activists in Roslindale talk about, though. Yeah - Grove Hall would make a lot of sense. I was just hoping that maybe with a full 4 track build + regional rail/all emu service it might be possible (along opening up slots by taking Needham off the NEC with Orange/Green replacements), since its on an existing row, and Rozzie Square is still over .5 miles away, and it would probably spur development on that portion of Hyde Park Ave/American Legion. Unfortunately the NEC is the one place where quadding + EMU'ing does not open up realistic infill opportunities, because of the need for express vs. local overtakes to make hay on building up speed between the Back Bay-Ruggles slow zone and Route 128. As is, Forest Hills can't be functionally added to any non-Needham schedules because the island platform there is squished to one side and would require crossing over the express tracks to the tune of numerous Amtrak conflicts. And the Hyde Park quad-track redesign simply replicates FH's squished island layout from lack of room on the Business St. side (where Track 4 ultimately goes). It won't be able to have its current 2-side platform layout re-created with 4 tracks. That's a deadly pickle for a Mt. Hope Redux stop. It can't be done as a 2-side platform even if room exists for it because both adjacent stops are going to be squished; it would induce even more crossover moves that can't be done with Amtrak traffic modeling. You'd thus have to make the infill platform a matching squished configuration to FH/HP so trains stay on the same tracks between intracity stops, and that ends up severely limiting which line schedules are capable of reaching the "squished" side. Consider that Forge Park schedules (the easiest of all for running on the squished side) are likely to get throttled-down on the NEC over time and throttled-up over the Fairmount Line for congestion mitigation, with an endgame future of likely 85-100% of Franklin schedules going via Fairmount. Foxboro--both the limited-trial set to begin and the full-blown proposal--are already slated to be captive to Fairmount from Day 1 to lower the Franklin main's impact on NEC congestion. Stoughton, as previously noted, is going to be forced to dump all intracity stops between Back Bay and 128 permanently for the sake of keeping schedule if it is ever extended to Taunton or beyond, and thus isn't a safe bet for pinning a stable lifetime schedule anchor on an expanded infill slate. Then consider that super-extended RI runs on Providence are going to skip the intracity stops anyway, and so you're left with basically the same underwhelming selection of Providence local-only schedules that leaves service levels at HP permanently half-cocked. With whatever increases come from Regional Rail-ification still falling several degrees short of what's possible at all the other Zone 1A intracity stops on other lines. It may not be completely broken transit...but it's broken-ish and of limited overall upside given all other mouths the NEC has to feed and how critical track+platform layout ends up being for feeding those mouths. Doesn't get much better in an NSRL universe either as length of schedule will determine slotting on the "squished" tracks vs. the express tracks. It's more slots, sure...but with all of the intracity stops getting exponentially more slots the NEC intermediates from FH to HP are still proportionately MUCH poorer-off on frequencies than the Fairmount corridor or comparable Allston-Newton stops on the Worcester Line. Writing's on the wall because if the "squished" layout is the only thing they can physically conjure there's no practical future for FH & HP stations on the NEC, and likewise no practical future for any new intermediates that span those two stops as they'd be locked into the same layout. So best move is to crank up Fairmount frequencies so HP can be outright retired by the time NEC Track 4 is necessary, and bring the Orange Line to Rozzie Sq. as a +1 or outright displacement of Needham CR. Historically, Mt. Hope ridership crashed at the turn of the century when streetcars debuted on today's 32 bus route. 20th century ridership was so very poor it's a historical mystery that it even lasted until '79 as a flag stop; it was either one of those Plimptonville/Hastings rumps that multiple generations of RR management simply forgot to prune and/or there were a couple long-dead neighbors with political influence being a stick in the mud about keeping it all that time. But a perma-solve for the bus route duplication & over-congestion on Lower Washington via truncating some routes at a new Rozzie Orange Line transfer will most definitely help the Mt. Hope Redux catchment as the 14 and 30 both cross @ Cummins & HP Ave. along with the 32. There's probably more absolute transit frequencies to be had via OL-Rozzie and revamped bus terminals than you could ever achieve via Regional Rail with only that crippled "squished" platform layout available to limited schedules. Only intracity NEC infill that doesn't suffer from that killer "squished" malady is re-use of the mothballed Readville NEC platforms, which have such generous slack space they can remain full-sized 2-side platforms when Track 4 comes back. If HP station gets abandoned in favor of service consolidation to Fairmount station, then there won't be any need for NEC locals on the outer tracks to do any crossing over of the express tracks anywhere outbound of Ruggles, making reanimated Readville side platforms a fully feasible service add at no congestion penalty. Obviously the NEC + Franklin platforms make for useful enough superstation transfer if the Fairmount side sees supersized frequencies, so that's one to shoot for even if today's Readville pales in comparison to Cleary Sq./Fairmount as a neighborhood transit center. Might even be possible to go >4 with the track layout if the whole works were shifted a couple hundred feet north re-centered around the Milton St. overpass, as there's a lot of derelict old platform space stretching far north of the current 1987 facility. Note also: the Fairmount platform at Readville will be moving from its current single-side location on the NEC overpass to a new site across from Milton St. in order to fit the double-track island platform that'll fully support true "Indigo" frequencies. So there'll ultimately be supportable logic in pursuing a reciprocal re-centering of the NEC- and Franklin-side Readville platform entrances around Milton St. to keep the whole superstation's sprawl as compact as possible. Since we're talking crazy pitches anyway, would it be possible to not think of these Rozzie/Hyde Park stops on the NEC as part of a longer distance line? What about an EMU shuttle from South Station to Readville, making stops at Ruggles, Forest Hills, Mt. Hope, and Cleary Square? It could run single track from Forest Hills to Readville, thereby avoiding any cross over issues, then reverse directions back toward downtown. so taking one of the locals for bi-directional running would hurt the local track setup and force locals onto one of the express train. Wouldn't work because that's exactly what the NEC FUTURE commission proposes for Needham & Franklin--single-track ops in the unexpandable SW Corridor tunnel separate from Providence/Stoughton/Amtrak on the other tracks. The end result is both schedules are permanently frozen at current levels for the peak period with no possibility of increasing frequencies ever because of the density limits of sharing dwells on a single track from Back Bay-Ruggles-Forest Hills. There's no ops optimization that'll close the headway gap...only crossing over and running into the sharply increased express traffic. Forge Park has ability to lather on more via-Fairmount slots to densify its service, but for Needham this is in essence the death sentence for it on CR mode imposed by the HSR 2040 modeling. Far off-peak backfill is possible, but average frequencies will always be far sub- Regional Rail and that's just not enough. Now, given that Mt. Hope Redux would have to match track layouts with Hyde Park and Forest Hills it's in the same boat--despite being outside the tunnel's 3-track constriction--of being handicapped by the same headway cap on the single track from BBY to FH. So, forever and ever sub- Regional Rail service levels. At Mt. Hope, absolute transit frequencies would be lower with the local CR stop than they'd be with optimized buses out of an OL-Rozzie terminal...by quite a lot. Now, if you believe that frequencies are most valuable you'd probably be willing to sacrifice limited-service and Fairmount-duplicated HP and not build equally limited-service MH to open up a much fuller schedule slate at Readville to make that superstation hit with serious heft. If instead you believe representation is more important than the frequencies you can't completely have, then you may side with building MH + retaining HP (just make sure to think holistically with multimodal bus improvements to cover the frequency shortfall CR can't physically make up here). Either viewpoint is completely valid if it aligns best with the neighborhood's priorities. Personally I think frequencies matter too much more to bother with these stops. Shore up Fairmount so HP can get dropped, work Orange + bus terminal optimization in Rozzie, and open up the NEC track layout to bring a substantial schedule bump to Readville superstation so every Zone 1A stop is getting full Regional Rail frequency equitability. That's probably best spread of resources, and definitely much better than having a stop exist only to have a tiny fraction of schedules able to actually use it. The NEC Infrastructure Improvements Master Plan (IIMP) sticks to pretty consistent platform layouts for MA/RI intermediate stops south of the Hyde Park constriction, with only moderate toughies and shared Amtrak stops deviating from the cookie cutter. Stations are due to have their track layouts uniformly expanded to full future capacity first before infill mainline tri- and quad-track is completely constructed to join them all together, because passing fluidity at station stops gives much more immediate boost to service density for the $$$ than constructing linear miles of new mainline track. So if they mod the stations first they get big service increases...and then the mainline track expansion can be paid on the installment plan by highest-priority segments to eventually buff it all out to max ceiling. The one commonality you see everywhere south of the SW Corridor constrictions is that crossing over is sharply curtailed by always having the locals 'bulb out' at a stop, never the expresses. That's important...and that's the one fatal malady that handicaps the Forest Hills-Hyde Park pair + any infills in-between. Note that some of these designs will inevitably change as the NEC FUTURE commission's traffic modeling for 2040 Superduper HSR came a couple years after the 2030-focused and Amtrak + NEC member states' DOT co-signed IIMP was released. The next revision of the IIMP is due for 2020 and probably will reflect the updated traffic modeling with some additional capacity expansion touches. Here's what it's going to be for all non- terminal district (i.e. excluding Back Bay & Providence) stops. . .
Last edited by F-Line to Dudley; 08-28-2018 at 10:45 PM. What about re-using the old piers next to the Alford Street bridge for a bus-only bridge and re-purposing of Beacham Street as a bus-only street heading into Sullivan? Put a new signal on the northeast bank of the river to allow buses to enter/exit Lower Broadway/Alford. Pulls all buses headed to Everett out of the racetrack. I think if you want the Silver Line to go to Sullivan there isn't any other way to do it. Follow the sidings from Mystic Mall to the Everett Bus garage, then the border between it and the casino, then either relocate or raise the Boston Water and Sewer building to reach the windmill property. Beacham's a major truck route for Everett Terminal, so it can't be traffic-restricted. It is wide and fairly low-volume otherwise so a re-striping with bus lanes is very doable. Trick would be negotiating with the Mall to use their back driveway as a busway, since that shortcut would shave critical time by avoiding a couple heavy-traffic signals on Everett Ave. I think we're talking about different streets. I'm saying re-purpose Beacham Street right at Sullivan next to the Charlestown garage. It lines up directly with the old bridge piers and funnels directly into Sullivan Sq station. There's no "re-use" of the old Charlestown El bridge piers over the Mystic. They're 108 years old, originally designed to carry a flimsy and severely weight-restricted open-decked El over a drawbridge span, and have been left derelict for 43 years in a river mouth with strong tidal currents pushing the bases out-of-alignment and salt spray eating away the mortar. This rubble pile isn't in good enough condition to hold a footbridge, let alone build a solid-decked busway over. To use the El alignment for a bridge means paying a gigantic cost premium to completely demolish the old piers in sensitive proximity to the Alford St. bridge and all manner of buried underground utilities crossing the river at the same spot...before spending one penny to even construct a new cleanroomed bridge. Try any wacky schemes to salvage something/anything from the rubble piles that are the El piers for a new structure?...pay twice as much as a demo + new build out of sheer construction unorthodoxy. Literally any spot along the Mystic would cost less for constructing a bridge than this exact spot where the El pilings are, simply by virtue of not having literal piles of ancient ruins to clear out first. So it is not a cost saver over the real-deal Urban Ring NE quadrant build to attempt to outsmart the field of civil engineering with re-use schemes for the El alignment as if it would pinch enough pennies for a decades-sooner "SL3+" compromise service. It is in fact a real-world cost multiplier over the price tag for the full-blown UR plan's Mystic crossing. Since the Mystic crossing is far and away the biggest-ticket item on the construction bucket list for completing the real-deal Sullivan-Logan Urban Ring quadrant for any mode, there aren't any shortcuts to be had in tossing novel bridge alignments at a dartboard or trying to chunk the last of the circuit's grade separation out in ever-smaller increments. Everything west of the current terminus on dedicated ROW requires loading up for bear to pay for 9 figures worth of poured concrete in fresh piers across the river and the flyovers (BRT) or duck-unders (LRT) to switch sides of the Eastern Route ROW at the Everett Terminal freight turnouts. FWIW...the cheapest Mystic crossing for a busway or light rail ROW is likely already standing in the form of the 1988-constructed Eastern Route bridge. Track spacing on the span is so wide and the emergency egress shoulders so generous that it is nearly wide enough to cram 3 RR tracks on...more than enough width to recycle for a fully to-spec busway if the span were retrofitted with tall-enough side safety barriers for BRT (or no mods whatsoever beyond re-grinding track profile if LRT). A new bridge, carrying relocated commuter rail, would then be built 80 ft. south on the old alignment of the pre-1989 Mystic drawbridge. Note: this arrangement of UR-north/CR-south also sets the correct side-by-side alignment of modes through the Everett Terminal turnouts until they have to switch sides of the ROW in the Santilli Circle-to-2nd Ave. span. Can easily see on Google where the old draw touched down on each shoreline. A new fixed span occupying that alignment would only need to be 700+ ft. long, at 850+ ft. in savings over the current '88 span which took a geometrically crummier alignment with steep inclines and curves so the old draw could remain in-service during construction. The RR would operate with significantly fewer speed restrictions if it came off the '88 span and got returned to the straighter old alignment, while the curves and steepness of the current span are not at all restricting for a bus or trolley. Win-win. That--mode change w/ minor retrofit on the existing commuter rail bridge + construction of a new CR span on the shortest available straight-line path--ends up by empirical measure the least expensive Mystic crossing money can buy for completing the circuit to Sullivan. Which is why that location bolted to the Eastern Route has conformed to the UR's officially-endorsed routing since Day 1 of the scoping studies. Just understand that any off-street Mystic crossing is a megabucks expense even on the most optimal bang-for-buck alignment Alternatives. There isn't a eureka solution laying under some random pile of rocks that somehow dodges the sheer bigness of bringing grade-separated transit across the river. That investment is grouped with the real-deal UR--and not the universe of SL3 tweaks-n'-tack-ons--for very good reason. It's a megaproject any way you slice it...albeit a megaproject with high, straightforward ROI. F-line...I believe you've mentioned this before in another thread I can't seem to find, but from google earth it appears there is room for 2 green Line tracks (coming from lechmere) to stop at Sullivan sq just west of the orange line tracks. Would the green line UR then duck under the orange line tracks to get on this alignment crossing the river? And is this part of any officially studied UR plans or purely crazy transit dreams? No assumptions were made on final mode choice, so everything in the grade-separated round of construction was predicated on either/or BRT and LRT compatibility. Considerably more attention and verbiage was paid to BRT at the time because the study was published during the peak BRT overhype era and the Silver Line's shortcomings had yet to exert a political price on the purse-keepers who were funding the studies. Re-study will obviously need to get its 'vision thing' in order on that mode choice, but all grade separation options under consideration are broadly compatible and cost-feasible with either mode. Re-study will need to benchmark them head-to-head in more detail to find which mode is optimal value. Empirical odds overall favor light rail as superior choice, with MA political odds still favoring BRT a little (but MUCH much less than before). Ultimately we're still reams of data collection short of making a dollar-by-dollar call on that. There are many possible "BRT-universe" scenarios that could legitimately win out over "LRT-universe" if the execution is cohesive enough. The options simply haven't been enumerated at enough detail to speculate. North half from BU Bridge to Logan conforms ~95% of the way on existing near-total grade separated ROW's in the form of the Grand Junction, Eastern Route, and GLX Brickbottom Jct. + GLX carhouse leads. And is technically feasible to do as BRT or LRT with few risks of incurring cost blowouts or neighborhood opposition (though BRT would need to take messier TBD path through the Brickbottom track maze than LRT). A re-study would pretty much serve this same routing up verbatim as the Preferred Alternative, and would only be graded against a couple minor-variation 'placebo' alts. for the final scoring. Those placebo alts. will include fussing around with Mystic bridge options to see if Assembly and/or Wellington could or should be included for ridership-packing or if straightest-line/lowest-cost Mystic crossing after Sullivan wins on value. So while other flavors will make the re-screening, the general route is so intensely well-vetted we know exactly what final scoring will say except for a couple of well-defined remainders like the Brickbottom BRT trajectory and Mystic crossings that need more data. In other words...debate away on bridge placement vs. Assembly/Wellington, but put the crayons away on wild off-ROW'ing schemes to hit downtown-proper Chelsea. South half from BU Bridge to Dudley to Southie is almost totally speculative because of no extant ROW's, and thus the crayon highlight the state did at the time does little more than designate a "future study area" that's several blocks wide spanning the whole half. This one will literally have to screen a mishmash of Alt. 's 1-20 vs. variation-Alt's 1A to 20Z to develop anything coherently resembling a route map, and has such diametrically different study needs vs. the north half that it may need to be spun off into its own wholly separate study. Harvard spur from BU Bridge--always sort of pitched as a later-phase tack-on--is likewise speculative, because at the time of the original scoping study the Beacon Park transaction with Harvard hadn't been consummated and it was unknown except in fantasy renders what land could/would be set aside in Allston for a transit reservation. We have much firmer view today of what that trans-Allston routing will be since Harvard now owns the land and has backfilled reams of hard info about its redev plans (if not exactly its redev timetable). The river-crossing segment from Western Ave. to Harvard Station has always more or less coalesced around a couple top-tier choices with alts. that mix/match elements of the primaries. Re-study will probably cull the routing options down to your typical lineup of Top 3 alts. for head-to-head scoring, which in turn will be heavily influenced by where they lean on the BRT vs. LRT 'vision thing' decision. Still a lot of study work to do here, but more a plug-and-play of discrete "if...then..." scenarios than the total free-for-all that studying the southern-half Ring will be. JFK spur from Dudley is nearly unprojectable on feasibility or primary routing because of the chaos in narrowing down southern-half routings. Its fate is tied in making sense of the southern options. The cross-Brookline tunnel from BU Bridge linking north-south halves was the most violently opposed component in the original study, due to its extreme cost and disruption. Since routing options for the south half were such a crapshoot, all they really did was take the one bit of archival engineering that was on-file in the State Transpo Library--the rejected I-695 BU-Brookline tunnel--and recycled it as a placeholder with 2 underground BRT lanes instead of 6 underground car lanes. Actually digging the thing is as much a destructive nonstarter as it was in 1970, so a UR re-study is going to throw that alignment straight in the trash. You'll definitely see the "bury the B from Blandford to Bridge" option highlighted in as tops in LRT-universe because under-reservation burial is the cheapest-of-all digs for junctioning the west end of the new system together AND ends up highest-of-all bang-for-buck for simultaneously perma-solving the B's congestion woes by portaling-up west of the most severe surface congestion at/around St. Paul for the rest of the trip to BC. For BRT options you may see a number of Mountfort St.-to-Kenmore surface and tunnel options scored. This could end up being the tipping point in favor of LRT, because all of the potential BRT partial grade separations in the BU Bridge-Kenmore study area are a lot messier-looking than the straight-on "bury the B" extension + underground junction. That's where past/future studies intersect. Now here's how you actually get between Lechmere and Sullivan on a trolley. New Brickbottom Jct. on GLX is set up with non-revenue crossovers and splits from each of the Lechmere, Union, and Medford directions for deadheading to the carhouse, as there's no room for immediate end-of-line yards at Union or College Ave./Route 16. Thus the junction is set up to be very fluid at shuffling 4-way non-revenue moves conflict-free, as operator shift changes will put *modest* bursts of non-revenue traffic through there a few times per day. The junction is overbuilt enough for that deadheading traffic and generous future growth that the Union<-->carhouse routing and Lechmere<-->carhouse routing can easily be put into full-route revenue service with only modest bottom-cost tweaks. Then, it's first a matter of. . .
Reconfigure switches on the GLX carhouse lead to separate yard-limits traffic from thru traffic, sort of like how the D mainline runs straight through Reservoir Yard without actually being inside Reservoir Yard mixed with yard traffic. May entail moving of a storage track or two to the other side of the facility to free up an end-to-end yard track, but the facility is going to debut well under-capacity so that's trivial. Cross 3rd Ave. (a.k.a. Commuter Rail facility employee driveway) on a private grade crossing next to freight track. Road's already gated for RR traffic, so would just need to have its gate timings tied into the trolley signal system for fluidity. Negligible traffic as driveway's restricted to only T employees, so gates being down constantly has no adverse effect. Dig an open-air cut beneath the two legs of the freight wye and create duck-under incline of those tracks (approx. length of cut: 600 ft.). Minor reconfig of freight wye switches to detach it from the Sullivan stub tracks and direct-attach it to the Eastern+Western Routes (all obscured below the 93 decks and Orange Line viaduct on Google). Straight shot to Sullivan Station. 2-track GL island platform w/grafted-on egress to existing station. Easy. Maybe even use this opportunity to create the long sought-after Perkins St. station entrance when bumping out the concourse over the Green island. Continue north. ROW runs out of room 850 ft. north of the Mystic Ave. overpass. This 850 ft. are where all TBD decisions need to be made on what comes next. ^^This^^ in and of itself is enough down-payment build to extend all C trains from North Station to Sullivan, and to have basic tail tracks stretching past Sullivan for shift changes and changing directions. If you're committed to building the rest of the Ring as LRT...you can go ahead and make very useful transit out of this first step today, for cheap. Determine what the Ring configuration has to say about Mystic crossings, reaching Assembly or Wellington, etc. Scoping studies, data collection, blah blah blah. You know you'll be hopping on the other side of the Orange Line after that 850 ft. of tail track north of Mystic Ave., but construction of that duck-under may be influenced by whether Assembly or Wellington are being crammed into the UR or if they study out as cost-warping surplus-to-requirement to the Sullivan superstation. For argument's sake, let's just stick to the straightest-line alignment to the current commuter rail bridge, and go with a scenario where LRT is taking over the existing span and CR is being shifted onto a new span built on the old drawbridge alignment. Begin duck-under tunnel at the end of the tail tracks. This is same spot where the Eastern Route begins pulling away from the Western on its own incline. Roughly 300 ft., sort of similar in construction to the commuter rail duck-under just south of Quincy Adams where the Old Colony switches sides of ROW with the Red Line. Pop up on other side in between the Western + Eastern tracks after they diverge. NOTE that if the Eastern is being relocated back onto the old drawbridge alignment the CR track split and remanicured hillside will move a couple hundred feet south of where they currently are serving up yet more room and flex for this LRT duck-under. Determine, when dirt-moving the hillside to swap the LRT approach onto the current Mystic bridge, whether that's *close enough* to Assembly to plunk a set of platforms before the bridge and connect it by overhead walkway to the Orange concourse. Kind of a long and awkward 250+ ft. catwalk to get all the way over to the Green side, but is that a good-enough compromise for including Assembly as a UR stop WITHOUT needing to distort the routing away from cheapest-possible Mystic crossing? I think hell yes, because that Orange-Green covered catwalk would still be 500 ft. shorter than the one at Wellington that passes over the yard between garage and station and is used by thousands of commuters every day. But YMMV on fit/finish, so let the studies inform final choices. On touchdown in Everett, you're on the correct track alignment: UR-north, CR-south. Casino stop, neighborhood and Bike to Sea trail-serving stop by Santilli Circle. Then after the curve and after the Everett Terminal freight turnout you have to switch ROW sides again to get on-alignment with the SL3 busway. The 2000 ft. of freight storage tail tracks between the Terminal split and 2nd St. can be sacrificed by building Pan Am and CSX more yard space inside of the terminal. Plenty of space alongside the gas tanks for that; the terminal, being a privately owned/operated entity and not a Massport joint, would just need the requisite gov't grant fun bux for the track expansion, but it needs it anyway. Note that there is an underground brook next to the ROW east of Paris St., so the area for switching sides is constrained at the east end by wetlands and at the west end by Santilli curve and the freight turnout. It's approx. a 1700 ft. window of opportunity. On BRT, you'd most likely need to build sprawling flyover ramps because doing a narrower duck-under coming off the curve would induce a painful speed restriction on bus. You can, however, use almost the entirety of the straightaway between Paris and 2nd to stage the flyover because the brook is a near non-factor for all above-ground construction. Might have some residents at the far east end of Paris kvetch about seeing buses out their 2nd-story bedroom windows, but feasibility is solid. On LRT you can save a lot of coin by doing a much shallower duck-under closer to the curve, since speed restrictions wouldn't be a factor on fixed guideway vs. bus. But it would need to happen earlier than the Paris-2nd straightaway because the brook wetlands are a factor on a dig. Probably the few hundred feet between the Broadway overpass and start of Paris St. is fully adequate for that. No-brainer feasibility, overall cost probably similar to the earlier duck-under of Orange in Somerville and less than the longer trench under the Brickbottom freight wye. Join SL3 busway alignment @ Everett Ave., and then all else is on existing transit ROW with whatever LRT-conversion or LRT+BRT dual-use customizations you want to make to the already existing build. Widening of the haul road cut for side-by-side instead of shared-use transit + trucks is maybe preferable, as would a transit overpass of Eastern Ave. for more nimble mixed-traffic sharing on/off the Chelsea St. lift bridge. But any of that can be deferred for interim street-running to save money for the base build, then be picked off individually later. Build Lechmere-Sullivan through tweaked GLX carhouse leads, duck-under of freight wye, expansion of Sullivan Station, stub-end tail tracks. Extend all C trains to Sullivan. Initial re-use of SL3 busway with remaining grade crossings, fully-shared bridge traffic, shared truck traffic on Eastie Haul Road. Install a short-turn pocket track at Eastern Ave. station to throttle headways around bridge openings. One-by-one elimination of remaining SL3 grade crossings Everett Ave. to Eastern Ave.
Re-landscaping of of Eastie Haul Road earthen embankments to former RR-era 4-track ROW width w/ new retaining walls. Side-by-side grade separation of road and trolley reservation. Pricey for new retaining wall construction, but not invasive because this was the RR cut's true pre-1960 width before it was partially landfilled. Last edited by F-Line to Dudley; 09-08-2018 at 05:55 PM. This is a tad distant from our usual fare here, but I’ve been pondering what Boston might look like if we managed to build the NSRL when it was originally first was proposed in 1910 - including electrification of the passenger rail system. Anyone have any particular ideas on ghe topic? Lots of info on this map, but I think extending the silver line multi-modal type of system on old ROWs (now bike trails) would be a good way to re-introduce public transportation back into the burb areas to connect downtown. Also the flexibility of electric or fuel would allow the routes to be tweaked until a permanent dedicated lanes could be introduced a larger boulevards in Boston's neighborhoods. I think replacing existing rail with BRT will be a very hard sell. I would terminate the purple BRT line at Rozzy Square, do the one stop Orange Line extension, then leave the rest of Needham as is for now. Not quite right location. Emergency exit from the Red platform (i.e. any future location of a Red-only headhouse) is here, bisected by tracing a straight line from the State House steps to Brewer Fountain. 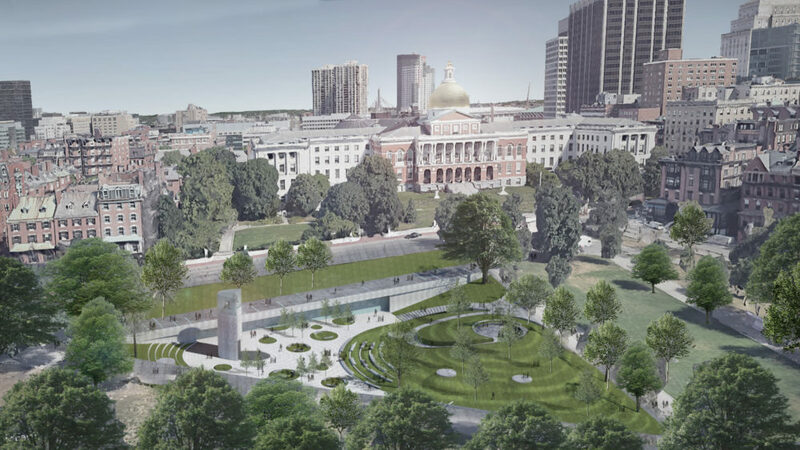 In the above render, that would be to the right of the memorial mid-grass between the two paths on the far right. Sort of above that really tall tree at lowest right of the picture (which gives some appreciation to how much closer that exit would be to Beacon St. than the current Tremont headhouse).